Climb into our impenetrable floating shark proof cage and feel the adrenaline pump through your veins as a shark swims towards you, opens its mouth and bares its big sharp teeth. Shark cage diving with the great white in Gansbaai is truly an amazing experience. Gansbaai in the Western Cape of South Africa is one of the world’s best, if not the best, great white shark cage diving regions. This quaint little South African fishing village, lies only 160km’s from Cape Town and is known worldwide as ‘The great white shark capital of the world’, making Gansbaai Shark Diving an extremely sought after experience. Not brave enough to plunge into the shark diving cage for a little adventure with the great whites? This is not at all a problem. Non-divers enjoy a spectacular view of the great white sharks from our boat without diving. The view of the sharks from on top the boat is in fact better than in the cage, just without the adrenaline of-course. You get an amazingly clear view of these magnificent predators while viewing from the boat. They look literally like submarines gliding past. Great white sharks are surface feeders and our shark handlers are trained to bring them up-close-and-personal against the side of the boat. Their heads and jaws are clearly visible. The bay also plays host to large numbers of Whales between June – Nov. 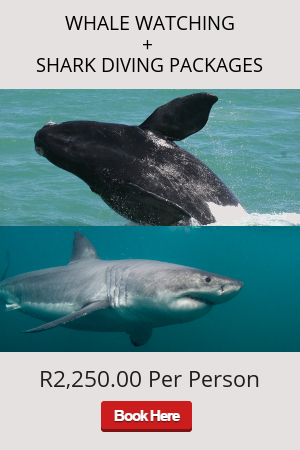 The Whale numbers often match even those of the famous territory of Hermanus. While on the subject of Marine mammals… schools of up to 500 Dolphins make a spectacular site and are often seen in the bay. Something you will quickly perceive on one of our trips is that Great White Sharks are not the undiscriminating blood thirsty killing machines that eat everything and anything that comes their way. You will come to understand and respect these beautiful animal for what they really are. Your trip will not only be fun, but highly informative too. All of this makes shark diving in Gansbaai, a unique and sought after experience. 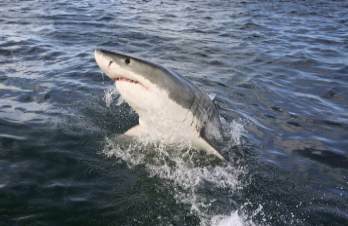 Join us on an morning shark diving trip in Gansbaai. We go out 7 days a week in the mornings and if we have enough people for a 2nd or 3rd trip, then we go out again. Mornings generally have the best conditions for the day with less wind, better visibility and the best shark activity compared to later in the day. Exact departure time is announced by the skipper and made know to you the day before your trip. Usually the 1st trip is at 8am, but this does vary and is dependent on weather & sea conditions. 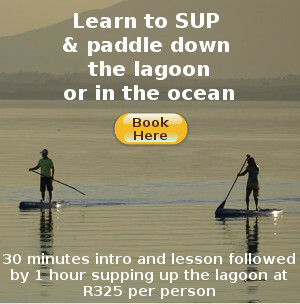 "This is an absolutely must when you visit Gansbaai or Hermanus!! This is an experience we will never forget. The crew looks after you very well and are quite skilled in locating and luring the Sharks." "This experience was one that I will never forget. My Father, my brother and I went into the cage while by Mother was taking pictures from above. The view of the sharks was better when in the boat but there is a massive adrenaline rush when you enter the cage. Recommend to everyone!!!"